If you're looking for a low-impact workout, stationary bikes make an excellent choice. However, some workouts on the bike are better than others. According to various fitness professionals and exercise equipment companies, including Ask The Trainer website, the best exercise bike cardio workout involves intervals with alternating periods of work and rest. Any interval cardio workout, should be adjusted to match your individual fitness level and fitness goals. Interval workouts are characterized by alternating between a high-intensity work phase and a rest phase. The entire cardio workout should last 20 to 30 minutes, including the five-minute warm-up and cool-down. A common interval includes alternating between two minutes of intense pedaling followed by three minutes of slow pedaling and repeated two to four times. The length of the work and rest intervals can be adjusted based on the goal of the workout and your current fitness level. During the interval cardio workout, you can use the built-in heart rate sensors to track your intensity level. A general rule for cardio workouts is to maintain a heart rate of 65 percent of your maximum heart rate. This heart rate zone is considered the recovery zone and is linked to developing basic endurance and aerobic capacities. Decreasing the length of the intervals to increase the intensity can increase the heart rate to 70 to 80 percent of your maximum heart rate, further improving the development of the cardiovascular system. Adjusting the resistance of the pedals on the exercise bike can increase the overall effectiveness of the cardio workout. On some bikes you can adjust the resistance with a push-button located on the display console or handlebars. Regardless of the resistance level, maintain at least 90 revolutions per minute during the work intervals and reduce to about 70 to 80 revolutions per minute during the rest intervals. 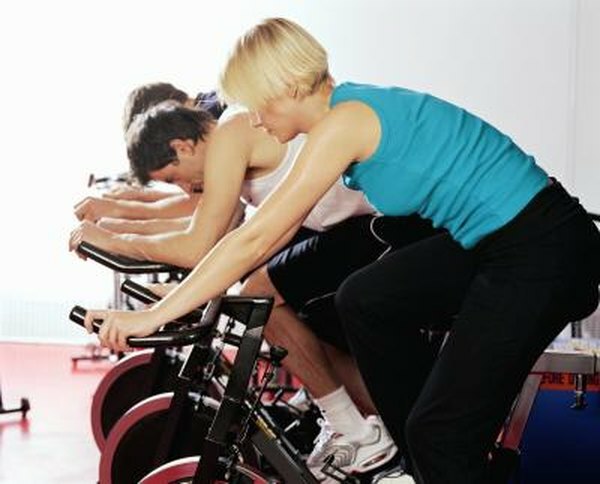 Most exercise bikes feature built-in interval workout programs that automatically adjust the resistance based on the work and rest time frames. You can choose the program based on intensity and length to match your individual fitness goals. An example interval workout is a hill profile workout featuring resistance levels that alternate between difficult, hard and medium based on the hill.